Fox News Channel’s “The Ingraham Angle” has seen growing TV advertiser departures, due to a controversial tweet from Laura Ingraham attacking a Parkland survivor, student/activist David Hogg. Nestle, Wayfair, Expedia, Nutrish and TripAdvisor have left the show, according to reports. Fox News Channel did not respond to inquiries by Television News Daily by press time. After a response from Hogg, including one that listed her top 12 advertisers on the show -- as well as some advertiser decisions to leave the show on Thursday -- Ingraham issued an apology via tweet. 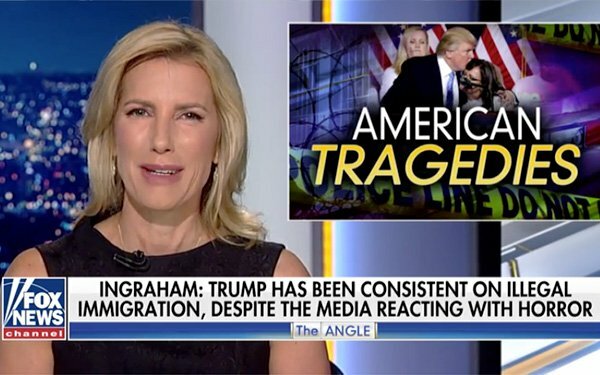 Since it started in October 2017, “The Ingraham Angle” on Fox News Channel has pulled in $75.3 million in national TV advertising, according to iSpot.tv. The top five advertisers during that time, according to iSpot.tv, include: Xarelto, $3.0 million (39 airings of its commercials); Symbicort, $2.2 million (42 airings); My Pillow, $1.8 million (153 airings); Wayfair, $1.4 million (54 airings); and Otelza, $1.3 million (33 airings). The next five are: Liberty Mutual, $1.2 million (136 airings of its commercials); Hulu, $1.2 million (86 airings); GEICO, $1.1 million (125 airings); Honda, $1.0 million (44 airings); and Nutrisystem, $964,000, (36 airings). On February 14, a mass shooting at Marjory Stoneman Douglas High School in Parkland, Florida killed 17 students and teachers and wounded 17. 3 comments about "Fox's 'Ingraham' Hemorrhages Advertisers After Parkland Tweet". Mark Bonin from WMTW, March 30, 2018 at 10:38 a.m. The more advertisers that flee the better. Her actions are deplorable. Rocky Kurland from The Magazine Guys replied, March 30, 2018 at 12:18 p.m.
she is not news, she is commentary. As such she gets to say what she wants. True, advertisers can come and go as they want but the gerneral public dictates thru buyng products not threats about sponsors leaving her. It seems the only time sponsors leave are from conservative viewpoint shows going overboard. Interesting with a major portion of TV spots being bought from the conservative NY market! What a joke, her ratings are strong and so she will have advertisers. When viewership goes down advertisers leave and Laura will be gone as well. Not so with the liberal talking heads, nothing is to liberal now days for advertisers it seems. Stan Valinski from Multi-Media Solutions Group, March 30, 2018 at 1:21 p.m. Whenever you think that Fox News commentators can't go lower, they do. The new slogan should be "Remember Ralph Peters"...when youre own Military Expert calls you a propaganda machine there is a dam good chance you ARE a propaganda machine.